One of the hottest UX topics discussed for JIRA is it’s restriction to only visualize three status categories by color. 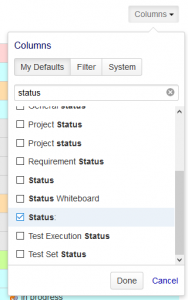 The free JIRA Statuscolor Plugin eases that pain by allowing to custom color each status in filter and gadget results. Just to make this clear right from the start. All credits for this awesome plugin idea go to Hugo Lassiege who developed this plugin in 2009 (as far as I can trace it back). Lewe.com just provides patches to the original open source plugin that makes it compatible to the most recent JIRA releases. Hugo, if you stumble upon this page, know that you are our hero for providing such a simple and free plugin that adds such a major UX improvement to JIRA! Hugo’s original release can be found here: https://bitbucket.org/hlassiege/jst/wiki/Home. The simplicity of the JIRA Statuscolor Plugin is still stunning us. It inserts a simple style directive into a filter result table row, coloring its background based on what you want the status to look like. A configuration page lets you specify any custom color for any status you have configured in your JIRA instance. That color information is linked to a new custom field type called “Status color”. Create a field of this type, add it to your filter result as a column (also works in the Filter Result dashboard gadget) and the background of the table row for each issue is colored based on your selection. What you see in the screenshot on the left is a filter result table produced with JIRA defaults. It contains the standard JIRA status field as a column. That column shows the standard JIRA status lozenges. 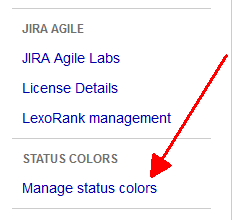 They show one of the three status category colors that JIRA offers. You will agree that it is not very distinguishable on first sight. The JIRA Statuscolor plugin will color the rows of a filter result based on your custom status colors. After we defined our status colors and added the “Status color” custom field (named “Status:”, note the colon at the end) to the result table, the rows are colored based on our color definitions. 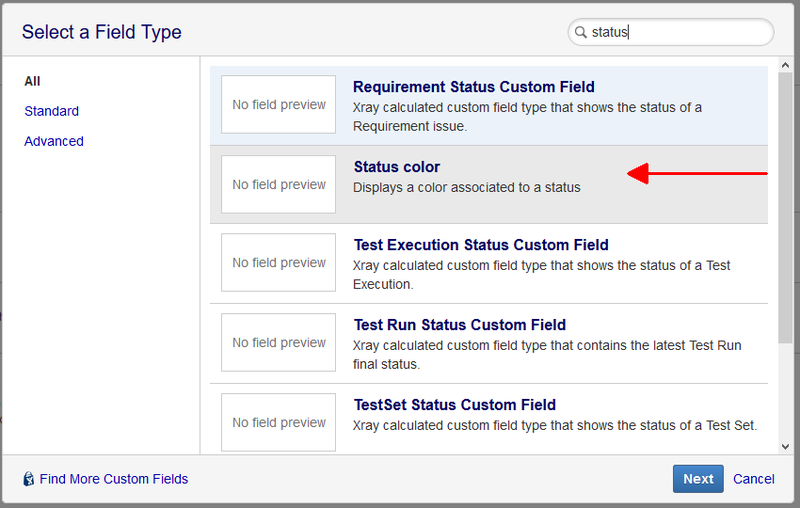 You can of course name the statuscolor custom field just as you like, even “Status” as the standard JIRA field. Duplicate custom field names are allowed. Adding a colon makes it easier to choose the right field from selection lists. You can also use the statuscolor custom field in you dashboard “Filter Result” gadget. Just add the field as a column and it will look similar to the screenshot on the right. The JIRA 7 version of our plugin also supports Agile Boards. Download the ZIP file according to the JIRA version you use. Unpack it so you have the JAR file on your local hard disk. Navigate to your “Manage add-ons” page in JIRA. Click on “Upload add-on”. Select the JAR file from your local drive. Wat until the installation of the JIRA Statuscolor Plugin completes. On your Manage add-ons page you will now see the “Manage status colors” entry. Click on it to get to the color definition page. The following page will list all your status, offering an Edit link to setup a color for each one. Chose a color of your liking for the status you are editing. A good approach here is to still think in categories. Design a set of status categories, we suggest not more than ten, and set a color for each. Then assign each of your status to one of those categories and use the category color for that status. 1 #ffd6d6 A light red indicates all open status. These status indicate that the issue was created but is not processed yet. 2 #ccffff A light cyan indicates all status that can be considered as “in progress” or “being worked on”. 3 #ffff99 Yellow indicates status where a clarification or an approval of some kind is required. 4 #ffddaa A light orange is used for analytic or preparational activities in a workflow or identifies a deferred or workaround status. 5 #ccccff Magenta indicates that the issue is currently on hold, cancelled or rejected. 6 #eeffbb A light green indicates a status of “readiness”. E.g., an approval has been given or an issue is ready for test. 7 #ccff99 Green shows that the issue is completed or resolved. Closure of the issue would be the next step after the resolution is confirmed. 8 #e8e8e8 Gray indicates that the issue is closed. The status colors are produced by a special custom field of type “Status color”. You need to create a field of that type. Logically, you should call it “Status”. We recommend to add a colon so you can distinguish it from the standard JIRA status field. So, a good name is “Status:”. In order to display the status color in your filter or gadget table, you need to add your new custom field that you created in step 3 as a column. 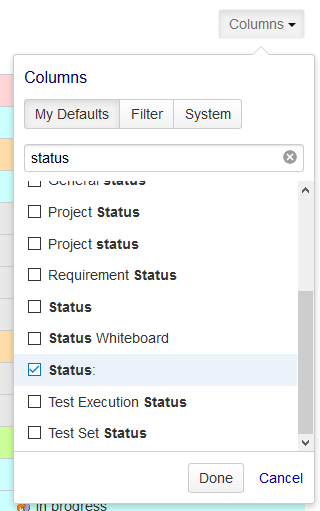 It will do all that the JIRA standard status field does, only that it will also color the issue row background. 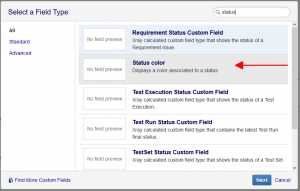 So, you can safely replace the JIRA status field with the Statuscolor field. We serve about 10000 JIRA users right now. From a UX perspective, the most pressing request we get from our users is to maintain the color coding of status. Considering much more expensive and sophisticated plugins we provide, the obvious superior value of this plugin to our users is stunning. You might experience the same once you introduce it to your environment. The word “status” derives from the Latin language. It is classified as the so-called U-declination which defines the plural of it being the same as the singular one: “Status”, only that the ‘u’ is prounced as a long vocal. So, there is one “status” and there are many “status”. “Stati” or “statuses” is just wrong, even though several online dictionaries announce “satuses” to be a valid English plural because it is more comfortable. I tried to download version 1.0.5.1 following the link posted on https://jira.atlassian.com/browse/JRA-36241 and I download completely, then try to unzip on Mac OS X using either the built-in tool or through Terminal and I get a cpgz-zip file cycle. Is the file corrupt?